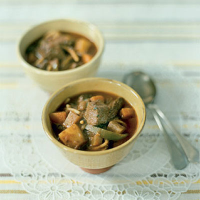 More of a soup than a stew, beef goulash has to be Hungary's most renowned dish. Recipes for it vary considerably – some are very simple, some are padded out with vegetables. This one is based on the stew I ate in the paprika fields of Kalosca. Sweat the onion, carrot and celeriac in the lard in a large pan over a low heat for 10 minutes. Now add the beef and fry for a further 5 minutes or so. Stir in the paprika, parsley, caraway seeds, bay leaves, crushed garlic, green peppers, tomatoes, tomato purée, chillis if using, salt and pepper and enough water (about 1½ litres) to cover the whole lot generously (remember this is more of a soup than a stew). Bring up to the boil and simmer for 2 hours, stirring occasionally and adding more water if necessary. Now add the potatoes and simmer for a further 10 minutes. Stir in the broken spaghetti and simmer for a final 8–10 minutes until tender. Discard bay leaves. Serve in deep bowls. The savoury, slow-cooked beef and the tangy sweetness of the carrots and tomatoes work a treat with a silky, ripe, southern French red wine.